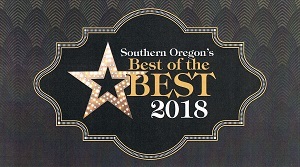 Thanks to you, our wonderful Wellspring Centre community, we’ve been nominated for Best Chiropractic Office in Southern Oregon’s Best of the Best 2018! We are so grateful that you value the gentle, upper-cervical chiropractic care that we provide. The next step, now that we’ve been nominated, is to VOTE for Wellspring Centre! Just CLICK HERE and click the green VOTE button. You will need to enter your email address to vote, and you will be able to vote only once in each category. Our mission at Wellspring Centre is to assist YOU, our patients, in restoring a balanced body, mind and life so your unique potential can be expressed in the world. By helping you live in alignment, so that you can give the world your gifts, we make the world a better place. We want to share our mission with as many people as possible, so that we can be a part of changing the world for the better! That’s why we want to win this thing! We hope you feel inspired to help make this happen, and encourage your friends and family to do the same. Thank you again! We wouldn’t be us without you.